The bottom line is that neither a flat nor pitched roof is better than the other. They both do the job they are required to fulfill, and do it well. The advantages of pitched roofs are they are the paradigm for modern housing because they add dimension which looks great and easily handle the local weather as rain and debris slide off due to the angles. Flat roofs, on the other hand, provide a place to put exterior mechanics of the building such as air conditioning units, and can potentially add garden or other outdoor space to a building with limited exterior property. Commercial buildings face different issues than houses. First, commercial buildings have an annual maintenance budget whereas homeowners try to keep a savings for emergencies and hope insurance will help cover structural needs. The flat roof, although it will last potentially longer than before a pitched roof needs replacement, has to have annual roofing maintenance. 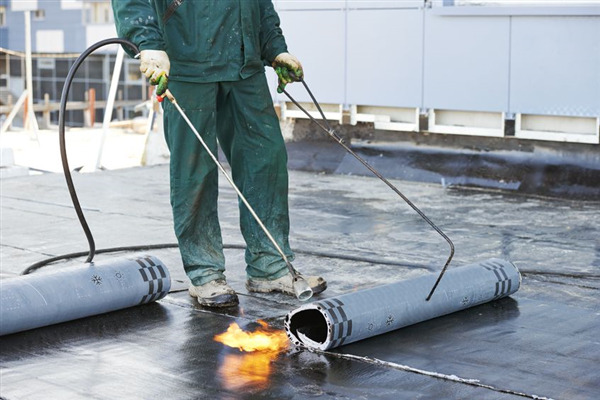 Major repairs are rare for a flat roof when the annual maintenance schedule is adhered to by the contractor in charge of assuring the building functions consistently at peak efficiency. Because industrial building lots tend to be used for buildings and parking, the flat roof provides a practical outdoor aspect typically provided by a deck or patio with a house. It is possible to build outdoor habitable areas on a flat roof. It might be a break area for employees to use, or used for experimental projects with environmental practices such as setting up solar panels or gardening, or it can be set up as a nicer place than the parking lot for an employee party and cookout. Ultimately, the function of the flat roof is up to the creativity of the management and employees who work in the building. Sometimes it can be the difference between a monotonous 9-5 job and a fun place where people enjoy spending their days. « Is a Membrane Roof Your Best Option for a Commercial Roof?